A Universal Phone & MP3 Holder With a Built-In Light. Stuff Points: Earn 13 points when you buy this stuff. 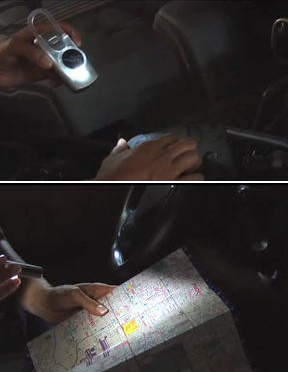 All of the convenience of the original ClipHanger, but with a built-in, two LED flashlight. This universal holder can be installed on virtually any phone, mp3 player or pda to become the easiest way to always have your device right where you need it. The virtually indestructible hook can be quickly attached to a belt loop, purse strap, luggage, your car's dashboard, around your finger and more to prevent unwanted dropage. With just one hand, and a simple flick of your thumb, the ClipHanger can be quickly detached to answer any incoming text or phone call, or to switch songs and increase volume on your ipod or other mp3 player. This universal holder is perfect for men or women, and offers a lightweight and extremely convenient way to hold your cell phone or mp3 player safely, securely and right at your fingertips. This version of the ClipHanger has two built-in LED lights, so your phone or mp3 player is not only conveniently stowed, it is also transformed into a mini flashlight for illumination when you need it. This great feature is perfect for lighting the way when you need to unlock your door at night, read a map in the car, find lost keys at the bottom of your purse, navigate those concert seats, and so much more. You will be surprised at how many times this little flashlight feature will come in handy. It has dual LED bulbs at the front of the unit, and it operates by a switch instead of a button for ease of use. Simply twist the ring on your ClipHanger to turn the super bright LED flashlight on, and it will stay on until you twist it back. You can operate it with just one hand, and it doesn't add any bulk to this lightweight phone holder. Two small batteries come pre installed, and are easy to change if necessary. The ClipHanger was designed to solve all of the common problems people have with the growing number of small electronic devices we all carry. Most women keep them in their purse, and by the time they are able to find them they have already missed the call. This holder quickly clips to the strap of a purse and keeps your phone or other device handy and accessible at all times. Since it is basically a solid loop when attached, you don't have to worry about it falling off, dropping or being crushed because it is buried. 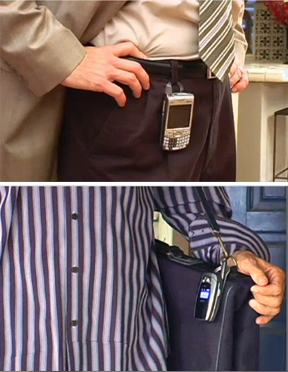 Men will often attach a phone to their hip using one of those silly holders, but these often flop around, add too much bulk, and are only good for one specific device. Not to mention that when you sit down, this type of holder is incredibly uncomfortable. 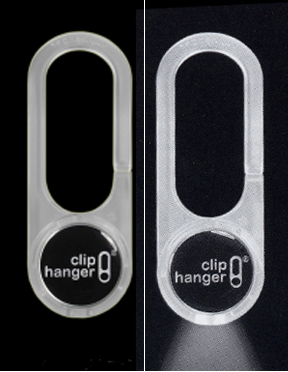 The Cliphanger slips easily around a belt loop, lays low and flat while sitting, and can be moved to a new phone when you get a replacement. It moves with your body so it will never snap off and break like many others do. Cliphanger, takes away the need for a case as it conveniently clips on to your belt loop and allows one handed access to your phone. Its thin profile minimizes bulk and won't poke you or cause discomfort, even while sitting. It is also made from durable plastic that won't break under normal conditions. It is a one-size-fits-all carrier for any of your portable devices. Stop searching for the perfect carrier for your certain model of phone. The ClipHanger is perfect for any model. Unlike typical product cases that add bulk and wear-out with use, this compact, sturdy tool hangs on lightly but securely. Despite its simplicity, ClipHanger is loaded with convenience. It keeps your phone tucked aside, but handy for answering incoming calls or checking the time. It's adaptable design can be affixed to any small device and since it is low profile you can put it in your pocket or hook it to your belt with equal comfort. Use it for your cellular phone, iPod, Mp3 player, radio, and more. It's industrial adhesive won't come off until you want it to, and won't damage your phone either. If you want to remove your ClipHanger, a simple twist and pull action will completely remove the adhesive, leaving no signs of it ever being there. A new adhesive circle is all you need to reinstall you cliphanger on another device without purchasing a whole new holder. ClipHanger Light - A mini flashlight and phone holder in one! Just stick, clip and hang. This innovative cell phone holder fits on any mobile device and is convenient and easy to use. Have always used the ClipHanger, but really like the addition of the light. It has come in so handy on so many occasions. I have one on my phone but I also have a spare that I clip on when I am at places that I don't want to bring my phone. Used the spare to walk to the fireworks the other night as it produces amazing light. Truly a great product. A Universal Clip That Fits Almost Any Phone or MP3 Player. Add A Pouch To Your Phone, Tablet Or MP3 Player. Hold Cards, ID's, Cloths, etc. A Rotating Phone Clip With Locking Latch. Use With Any Mobile Device. A Versatile Phone Clip With A Slim Profile And Locking Latch. A Stick-Anywhere Hook To Easily Hang Phones And Other Devices Right Where You Want Them. Move Your Clip To A Different Device With This Sticky Tab Replacement.